As I've mentioned before, I'm a bit of a spendthrift. So, when I have the money to buy something that I want, it's really hard for me to resist. 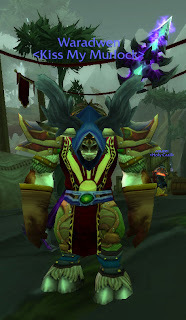 After last night's Kara festivities, I had enough badges to buy a primal nether and make myself the [Windhawk Belt]. Woot! UPDATE: I logged on early this morning and picked up a couple of gems for this beauty. I grabbed a [Great Dawnstone] for the yellow socket (mmm...+hit) and a [Jagged Talasite] for the blue socket.